It’s that time of the year again when cotton candy clouds dot the skies, the strong fragrance of Shiuli hangs in the air, the kaash sways gently in the light breeze while the beats of the Dhaak becomes the background score of our existence. 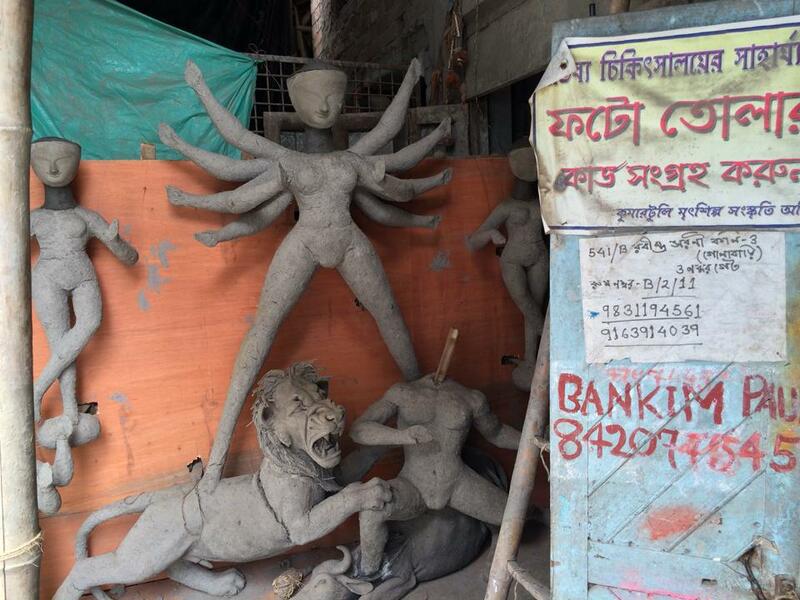 Yes Durga Pujo is right round the corner! Soon the streets will be filled with pandal hopping men and women preening in their brand new clothes, imposing pandals hosting larger than life Durga Protima resplendent in all its fineries, gastronomical delight spread out on the streets, while the streets dress up too in LEDs and ‘alponas’. This festival is no less in size and scale than the well-known crowd pulling carnival of Brazil. Durga Pujo has emerged from the strongholds of the zamindar into the masses and has slowly grown from Baroyari to Sarbojonin Pujo. 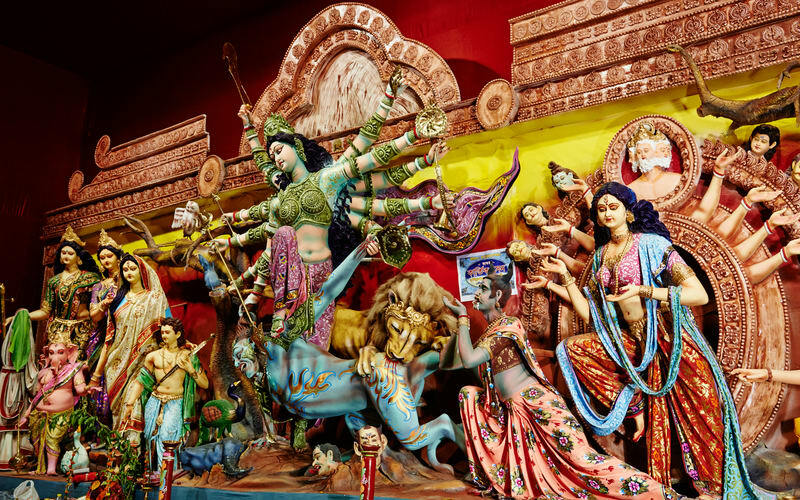 As the city erupts in celebrations, everyone comes out to mingle and partake in the festivities of ushering in Ma Durga and spending time with her for the next few days. 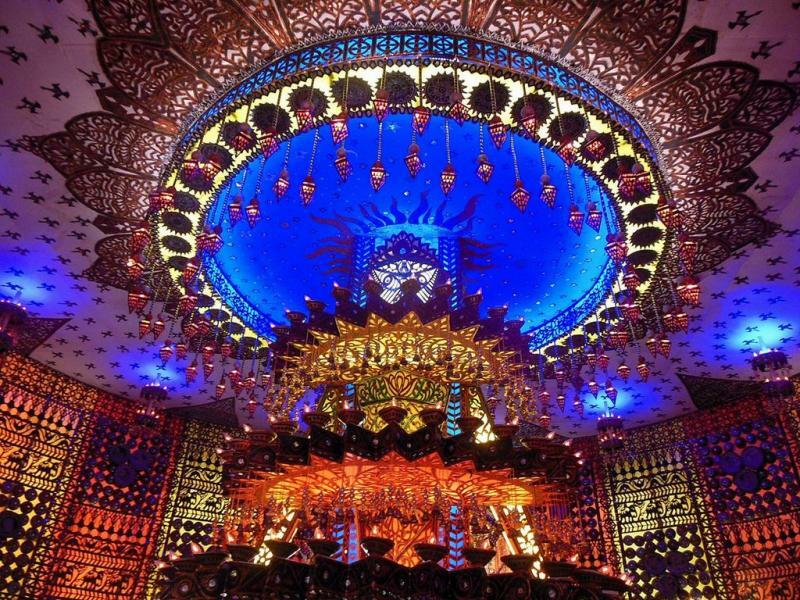 Though there are voices that say that Pujo is becoming only about competing to be the grandest of pandals and Protima and the spirit of simplicity is getting lost in the wave of flamboyance and grandiosity. 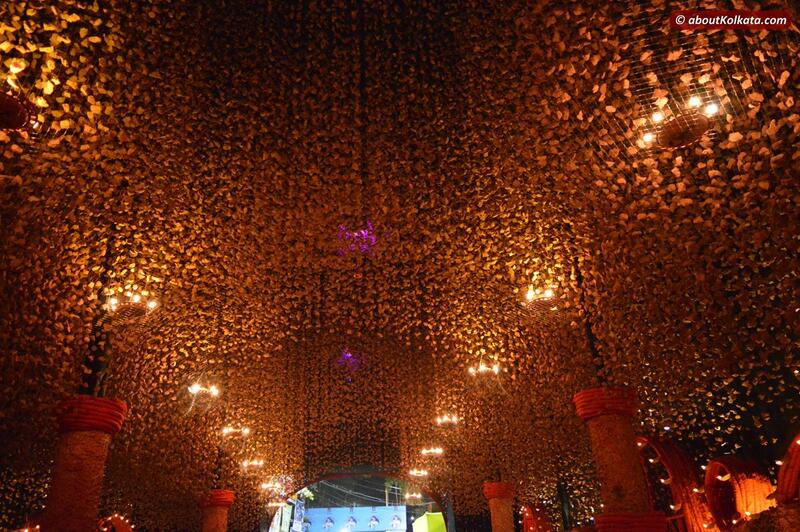 While millions go starving in our country, money flows like a stream during Pujo. Yet isn’t it a fact that the magnificence that is showcased employs thousands of artists and artisans. 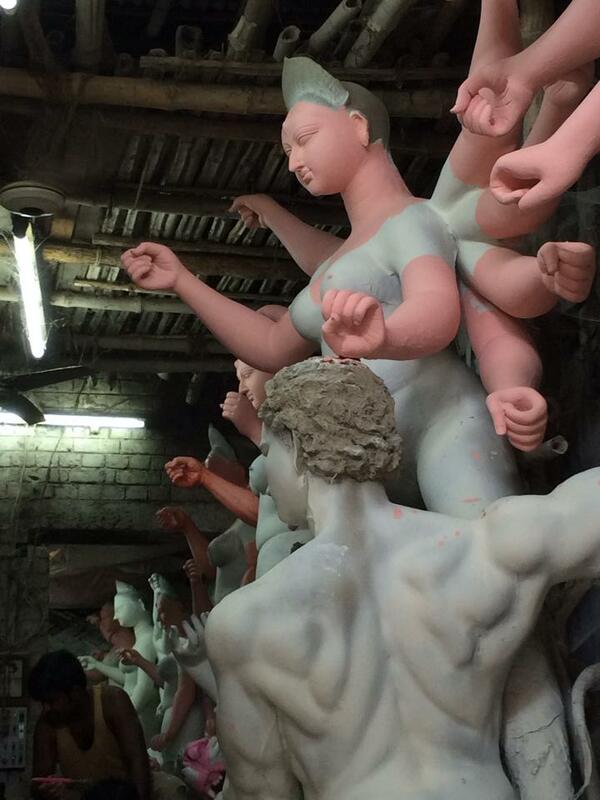 Their creative genius would never have seen the light of day had it not been for the Durga Pujo. 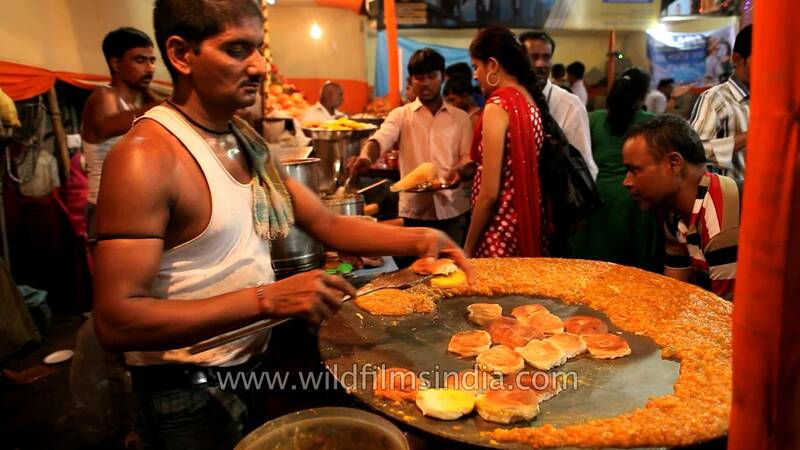 For many artists this is the only livelihood and they prepare for it for the whole year round. Imagine their pride when the artistic wizardry wins not just accolades but also tourist from all over the world. 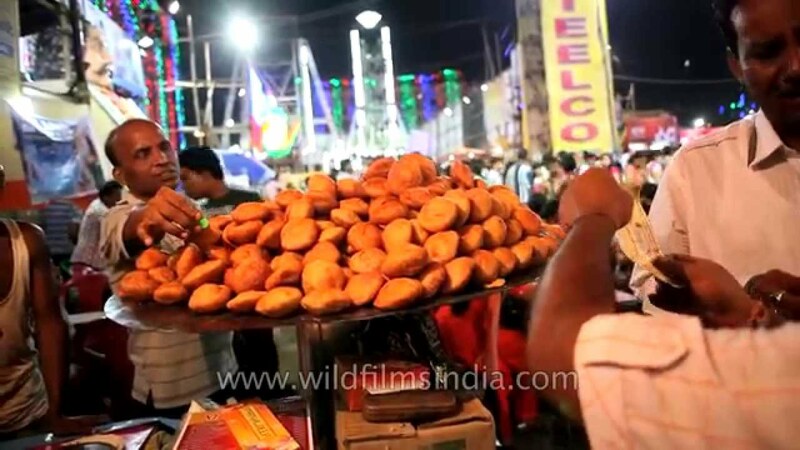 With the deluge of crowd, the eclectic Bengal Street Food gets a fresh breather and with that the vendors too get a shot of oxygen for an entire year. The income during this season helps him look after his family for the year until the next Durga Pujo. 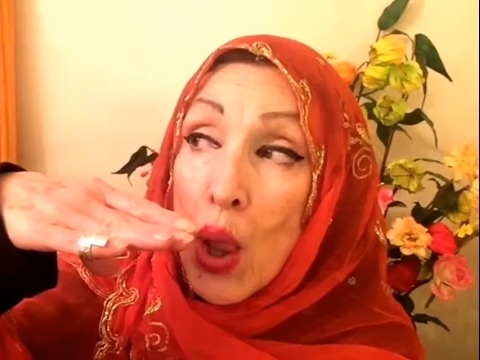 It’s like Ma is blessing one and all with Plenty – Plenty in mind, body, spirit and wealth. As the mind and body satiates in the sights and sounds the spirit is awakened too. The spirit of community, the spirit of brotherhood, the spirit that keeps the soul from disintegrating. 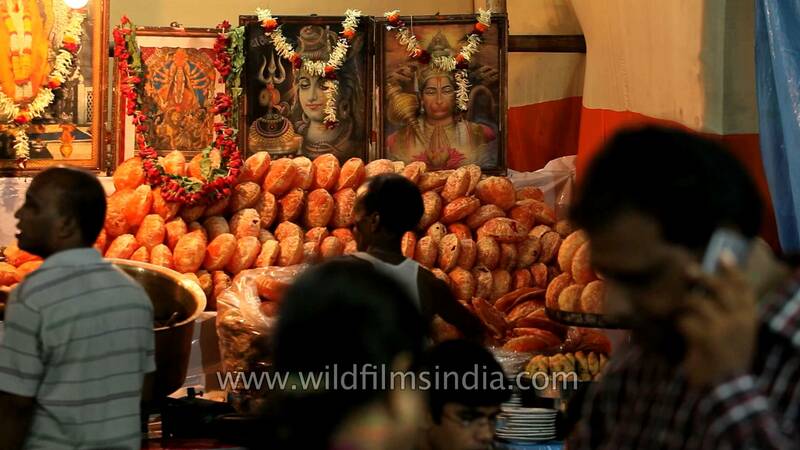 We forget out differences and come together to prepare Bhog for Ma that is distributed amongst all in the community. What better way to foster brotherhood and friendship if not cooking for one another. The spirit of Durga Pujo is just that, feeding the mind and spirit through brotherhood. This is one festival that is celebrated irrespective of religious beliefs, promoting mutual respect and equal opportunity for all. 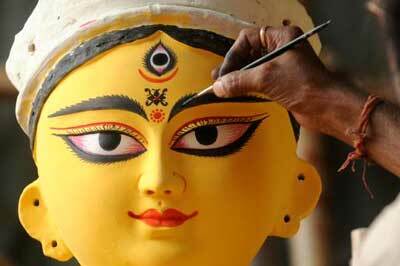 Durga Pujo was never about the ritual though it is an intrinsic part of it as it fosters coming together. Coming together to offer prayers through anjali, coming together for bodhon, when the ladies prepare Ma as she leaves for her heavenly abode. 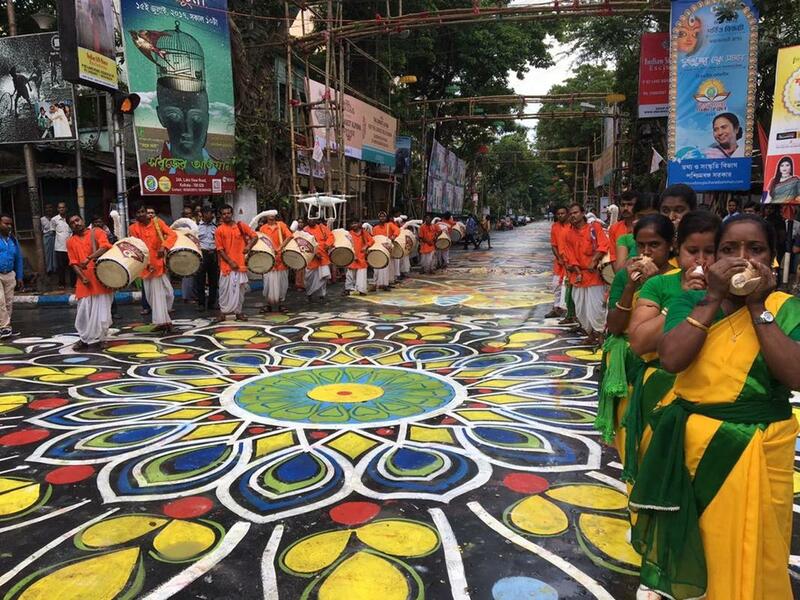 It is not just celebrating homecoming for Ma, but also the homecoming for all those who have lost their way in petty jealousies, religious differences, arrogance and whataboutery. It’s a time when we recognise and celebrate that humanity is all about Kindred Sprits. As a Bengali I have heard ‘ulu’ and even tried to join in to emit this high pitched, almost howl, vibrato along with my mother and aunts during auspicious occasions and community rituals. 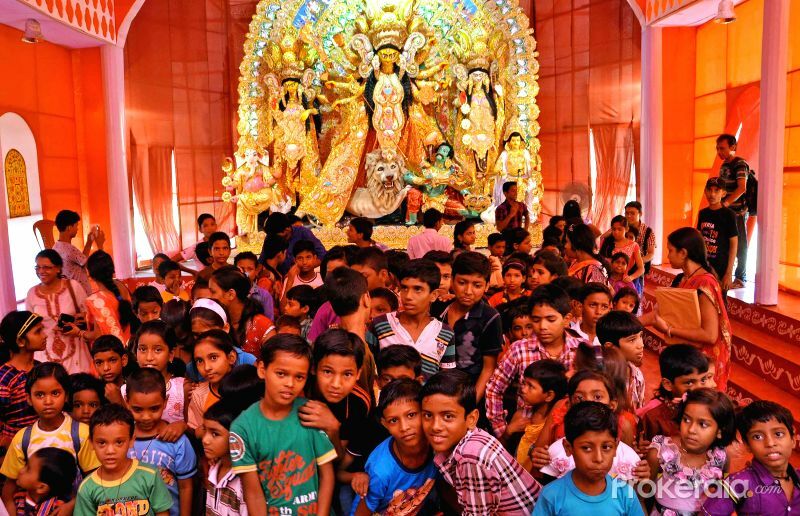 One of the most auspicious occasions and a community event for a Bengali is the Durga Pujo. The fun, frolic and festivities have started already amongst the Bengali Diaspora all across the globe, and we will be ushering Ma Durga into her earthly abode with a long drawn and deep bellow of Shankh (conch) and a million women’s ulu in different sharps and flats. I have always regarded ulu in its present form as a Bengali customary ritual during festivals and for worshipping the myriad Gods and Goddesses that we believe in. So when I stumbled upon where ululation came from it fascinated me to learn that the word originated in Latin and was practiced in Africa, Asia and some parts of Europe. The origin of ulu and how it diffused into other cultures is still unknown and there is not much written about the practice of ulu anywhere. Nevertheless ulu is popularly known to have originated in Sumer. The ancient Egyptians ululated as did the ancient Greeks and the Hebrews. Zaghareet, ululation again, is well known in Levantine society and it focuses on the sound as an exotic terrain and is often associated with ferocious war cry, unlike in other cultures where ulu is more of a celebratory sound produced in unison by the women. Its interesting to note that despite seeming differences in culture, religion, way of life and the conflict thereof that plagues the world today, we have unconsciously adopted and perform similar rituals and partake in festivities and community ceremonies much the same way. And it makes me wonder, are we that different? Carl Jung’s collective unconscious increasingly sounds true to me and its not just limited to universal symbols like the ‘great man’ or the ‘tree of life’. The unconscious mind has transcended race, colour, religion, miles and miles of distance and has formed a bond where we share and celebrate differences in our sameness. The Gods must be having a laugh then, to see us divide ourselves in orientals and occidentals, black, yellows, coloureds and whites, white collar and blue collar, slaves and masters, pretty and seemingly ugly (thats the worst differentiation), smart and the clever and the list is never ending. This Pujo I can only hope that Ma Durga grants us the wisdom to bridge the ever widening chasm of vacuous and mindless intolerance and bless us with the ability to honour and rejoice in each others uniqueness. Because there is no escaping that bound by our collective unconsciousness and at the heart of it all, we are kindred spirits. Isn’t it amazing that despite the society looking down upon and ostracizing the prostitutes, the deity of our Goddess is incomplete without the clay taken from the surroundings of her own dwellings. Before it was stigmatized as mere fleshtrade many of the ‘bayijis’ were musicians and dancers or rather courtesans of repute. Though they were given their due respect, their lives were not respectable. Hence it was much later that music and dance stepped out of the ‘baiji’ area, and spread its wings into the more dignified and honorable neighborhoods, ensconcing themselves graciously into our daily lives. Unfortunately today these ‘baiyijis’ have been stripped of the music part, and are left with only antipathy and odium that goes with harlotry. Yet the age-old custom didn’t cease to exist. No matter how much you disrespect and look down upon her, this one time in the entire year, and perhaps the most important time in the entire year, we have to beg at her doorsteps for a little bit of clay, elevating her status for that one tiny little moment. So how did it start? The story goes that one day Parvati was observing the daily chores and routines of the earthlings. She was aghast to find that men were visiting other women out of wedlock and was besides herself to see the pain, trauma and stigma, these women faced in the society, yet the respectable and honorable men visiting her didn’t seem to be affected at all. She ran back to Lord Shiva at Kailash and asked him why he chose to shut his eyes towards these poor women and that he must in some way redeem them. Calming Parvati down, Lord Shiva blessed these women with the virtues that others brought to their doorsteps. Every time a man visited them, he would have to leave behind all the virtues he had accumulated over his lifetime and when returning back he would take back all the ominous deeds of the woman he was visiting. Over time the other woman and her dwelling would be overflowing with virtues whereas the man’s quarters that he shared with his family, would eventually become unpropitious and inauspicious. Therefore every time Parvati comes down to earth, her clay deity is incomplete without the virtuous clay from the prostitute quarters. 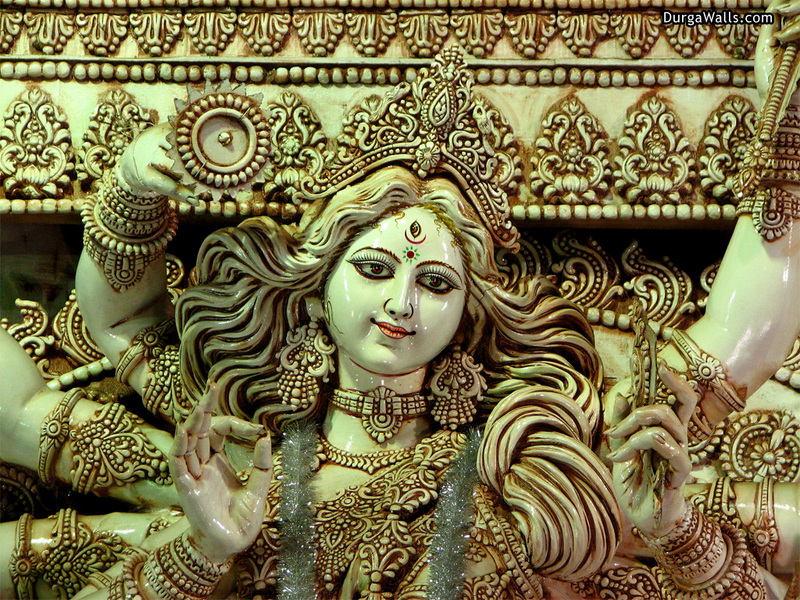 It not only blesses the fallen woman but also infuses the ‘debi’ spirit into the clay Goddess. The Night Jasmine or the Coral Jasmine has a unique story behind it. But before I tell the story I must warn the readers that our mythology and religion is rampant with intriguing stories – stories that might very well keep you awake many a thousand Arabian Nights. 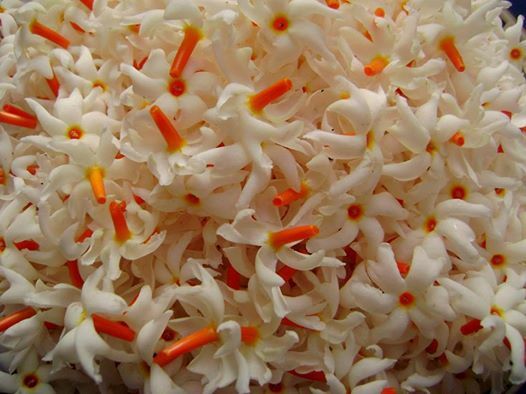 Nyctanthes arbor-tristis, popularly known as the night Jasmine or as the Bangalis have named it ‘Shiuli’, is the only flower that can be picked from the ground and offered as prayers to the gods. The other flowers need to be plucked from the trees and the fallen ones are not considered holy enough to be offered. So what makes the Shiuli so special? There are a couple of stories about Shiuli and how it came to be the way it is. It so happened that during the Samudra Manthan process, why the gods needed to churn milk from the sea waters is in all likelihood a very classified information to this day, nevertheless, without digressing further, the manthan churned up not just milk but also the enchanting Parijat, the tree bearing shiuli. Krishna was so enthralled by the ethereal beauty of the plant that he battled with Indra to possess her. It was not only Krishna who was mesmerized by the beauty and the fragrance of Shiuli but his wives too were drawn to it. He therefore planted the tree at Satyabhama’s courtyard but much to her ire the flowers fell on Rukumini’s garden. Hence ensued another bitter imbroglio amongst them. Of course Krishna with all his clever and wit put their differences to rest. There is another lore about Shiuli. It so happened that Parijat had lost her heart to Surya the sun god. After much ado Surya agreed to marry her, but he had a condition, if ever Parijat was to turn herself away from him, she would lose him forever. Parijat was so elated that Surya finally agreed to be hers, that she was willing to accept the condition put forth without realizing the implications of it. Parijat and Surya led a blissful married life, full of love and desire for each other throughout autumn, winter and spring. With the advent of summer the climate changed and it became excruciatingly hot, especially in the afternoons. One such afternoon, Surya wanted to visit his loving wife and be by her side. When Surya came before Parijat, the heat nearly burnt her up and she flinched for a moment, breaking the promise she made to her husband before they got married. In his rank and anger, Surya left Parijat and she soon wilted away. But Parijat’s love for Surya was true and at the behest of the repentant Surya, the gods brought her back to life. Since then she has been bearing flowers at night and shedding them away at the first rays of sunlight. It is said that surya visits his beloved in the night and his kisses make the flower infinitely more fragrant and hallowed so that they can be offered as prayers to the gods even though its been shed on the ground. Interestingly the Nyctanthes arbor-tristis is not just the native of Bengal, it can also be seen in full bloom at Kanchanaburi in Thailand. The flowers have immense ayurvedic importance here. The locals of Kanchanaburi believe that this flower possess the power to heal because it can feel the pain of the wounded. Hence they use the flowers not just for offerings but also to make a yellow dye for the clotting of blood. The myth about Shiuli has travelled from India to Thailand and is revered equally in both these countries. In one, Shiuli’s sweet fragrance ushers in Sharod Utsab and in the other it acts as a panacea for the bleeding hearts. Denim is a fashion statement we all like to make. We can design it in any which way we want but the coolest one is the distressed type. The absolute latest in distress jeans is, the Zoo Jeans, and who pray are the designers… they are, hold your breath guys, the lions and the tigers and bears. Its as wild as can get! Zoo jeans is created with fabric that is pre ripped and chewed by the creatures in the wild before they are made into trousers that we can wear, oh so fashionably. Just when we thought that jeans can be only that much stressed and distressed and we cant get more innovative than that, BANG comes Japan’s Zoo Jeans to take the world by storm. This is a charitable initiative conceived by I&S BBDO for the Kamine Zoo at Hitachi City. The denim is wrapped around a favourite toy of the animals and is left to be ripped, clawed and chewed by them. The added benefit – chewing on denim keeps the carnivores teeth healthy and strong. Hmmm next time I visit the zoo I will rethink my decision of wearing jeans. The chewed material makes for the distress design of the final product. These jeans have been auctioned and the money has been used to benefit the zoo as well as the World Wildlife Fund. With Air India in financial disarray, the government is thinking of privatizing the company so that it can be saved and returned to its former glory. 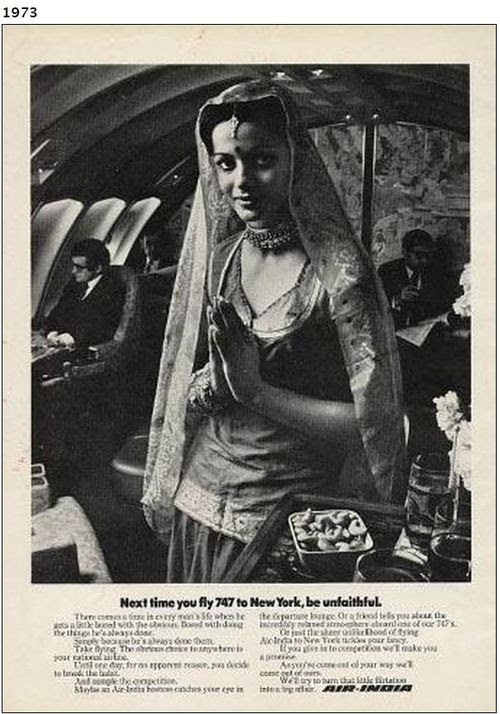 Lets take a trip down memory lane of Air India. The first Business scion of India, J. R. D. Tata, formed air India along with Neville Vintcent to mail flights from Bombay, now Mumbai, to Colombo. After three long years of negotiations they finally managed to get the contract to carry mail and thus was formed the aviation company of Tata and Sons. n 15 October 1932, J.R.D. 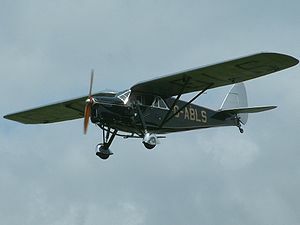 Tata flew a single-engine De Havilland Puss Moth carrying air mail (postal mail of Imperial Airways) from Karachi’s Drigh Road Aerodrome to Bombay’s Juhu Airstrip via Ahmedabad. Tata Airlines launched its longest domestic flight – Bombay to Trivandrum with a six-seater Miles Merlin. 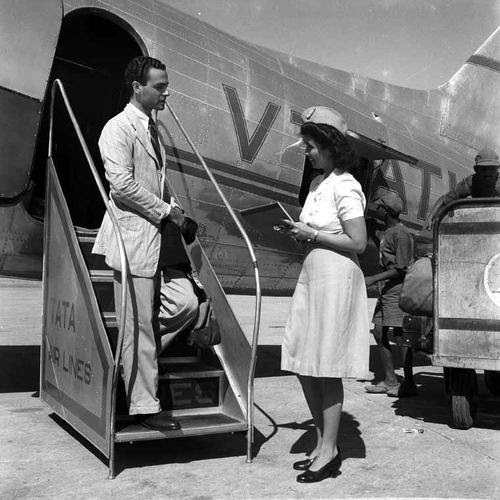 In 1938, it was re-christened as Tata Air Services and later in the same year it was again renamed as Tata Airlines. By this time Delhi and Colombo were also serviced. 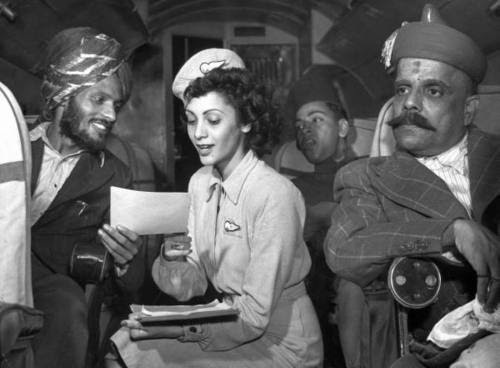 After the World War II, Tata and Sons became a public limited company on 29th July 1945 and the name was changed to what we know now – Air India. From the archives of Hindustan Times and Google life here are some photographs that will make us proud of one of heritages that is lying in utter decay. 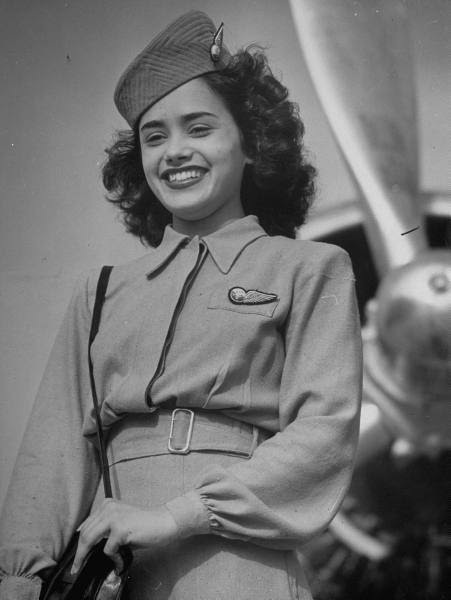 One of the very first flights in 1946. 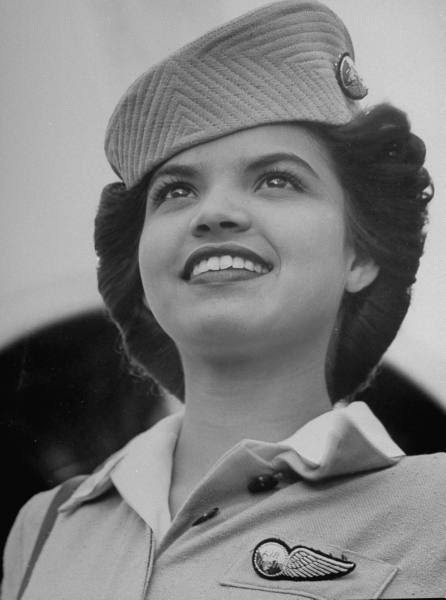 In 1946 airhostesses were first introduced. Some of the leading airhostesses of yester years. 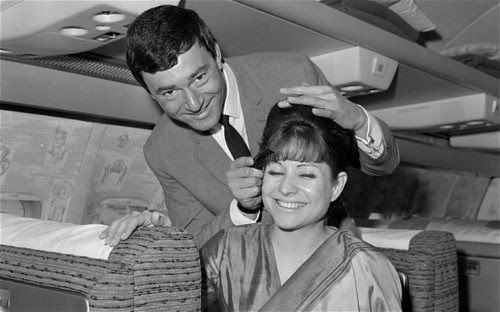 Here we have Vidal giving some hair grooming tips 40,000 feet above land, en route from London to New York in 1965. The innocent large eyes, giveaway who the dark haired beauty was. 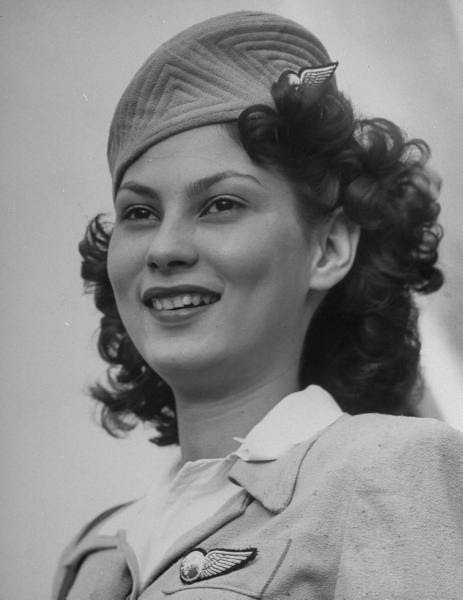 She created waves in the film industry at a later date. Yes you guess it right – Ah yes! 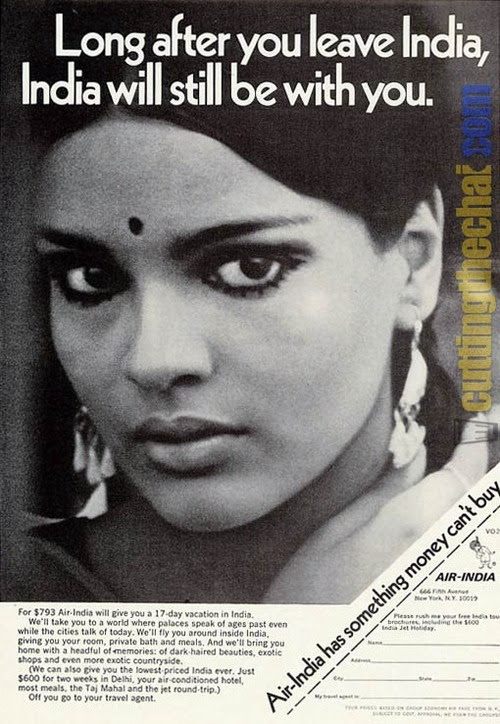 she is none other than Zeenat Aman. 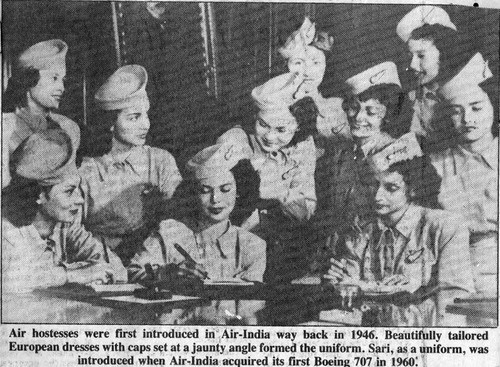 Soon came in a bevy beauties who creates quite a flutter in the air and in land, they were Nilu Gaekwad, Sunita Gareware, Parmeshwar Godrej, Maureen Wadia and Nina Pillai. They not only ushered in a cosmopolitan trend but also brought in social acceptance. Here is Paremeshwar Godrej carrying in sari with elan and style. 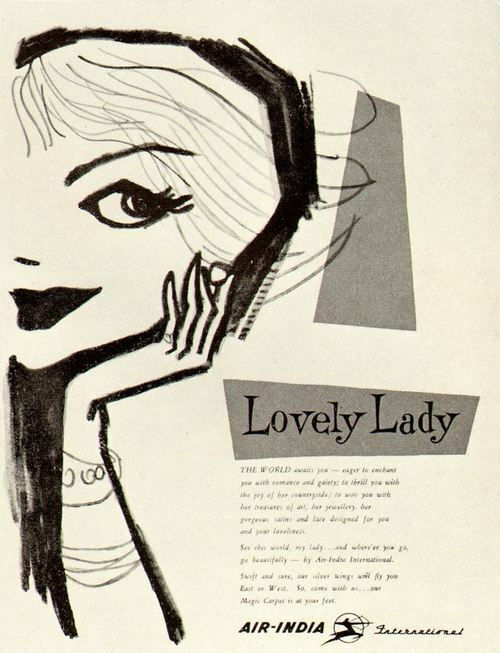 And a much later ad, ‘Lovely Lady’, by JWT, Mumbai. Film stars have always been interested in politics, or so we think. 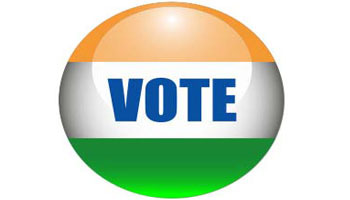 Stars have fought elections against seasoned politicians and have won too. You might remember how Big B won against Bahuguna or how Vinod Khanna won. Our society has always been star struck and the political parties have rightly used star power and magnetism to garner votes. Moreover just as the star power and charisma starts fading we see our prolific Bollywood head honchos heading for the coveted Parliament. Yes, if we see rationally, a star has the power to go beyond his or her glamorous stature and take a social stand whereby myriads would notice and follow suit. A star can definitely motivate the millions, highlight a social issue and convert it into a nationwide cause they can also raise fund for charitable purposes. So far so good! Nowadays we have a modern day crop. They are stars by right, they have their political affiliations and allegiance, and they have a strong opinion about the right political party doing the right thing by India. They have gone about touting what people must do. They have been vocal about our sovereign and democratic rights. That every single one of us should go out and vote and make a difference so that we can see the right people running the State of Affairs. They have been preaching us that we are responsible for electing our leaders and we should exercise our rights very carefully. They do need to be applauded for taking advantage of their celebrity stature and asking India to do the right thing. But hey presto what happened during elections? When it was time for all of us to exercise our voting rights? 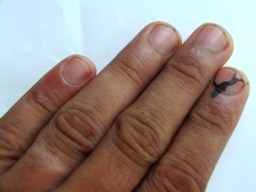 Is it only for us laymen and not the ones who have been egging us to vote? But of course lets not forget there was IIFA and it was scheduled much before the elections and some of our beloved stars had to perform at IIFA, the prestigious award ceremony. So of course in the list of priorities award ceremonies get more importance than electing leaders. After all these leaders will not be paying us or feeding us neither will they bring the so-called millions into our kitty. So the lesson learnt here is always talk but never walk the talk!